YouTube Player app for Windows 8 brings the aesthetics of Windows 8 Modern UI to your favorite video player app. Just like any other YouTube app in the market, it allows you to search and watch a stream and also share videos with your friends. 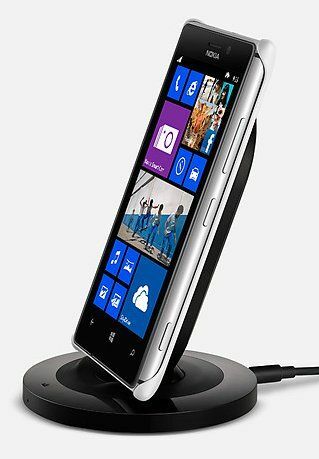 The official launch of Windows 8 is nearing and we have started seeing a crescendo in app submission. This itself is a good sign for the future prospects. 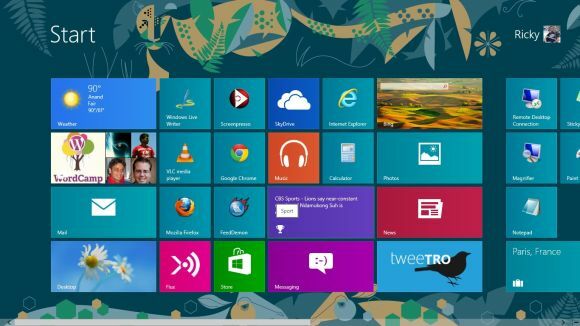 Our dedicated section of Windows 8 applications will help you to find out potentially good application for newest and greatest OS by software giant, Microsoft. 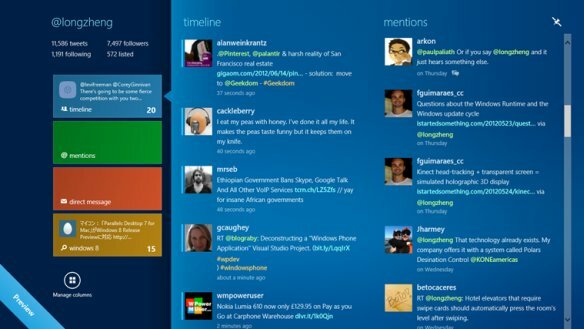 Several feasible Windows 8 Apps optimized for tablets are achievable that can work efficiently with desktops also. Officially there’s no YouTube app in Windows Store, but a new app called YouTube Player loaded with some commendable features has been added. To embrace the entertainment, YouTube player app adds its own flavor to the unofficial client. YouTube app allows you to search any kind of videos with the help of charms menu and get the results shown in thumbnails with a brief description. Also you can watch videos in any of the modes, normal or full screen with the help of controls. 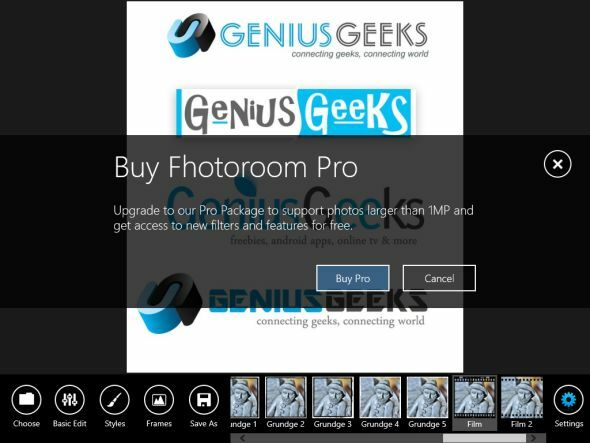 The recent software that has appeared in Windows 8 store is YouTube desktop app i.e. 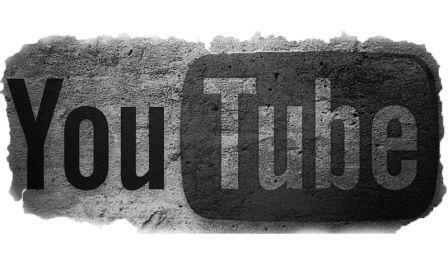 YouTube 8. It’s a desktop application to watch YouTube videos on desktop or Windows 8 PC. In case, if the video is not available in your territory, you can follow our previous guide to watch blocked YouTube videos. Let’s not mistaken YouTube app for YouTube downloader, since they both vary in the nature and serves a different purpose. 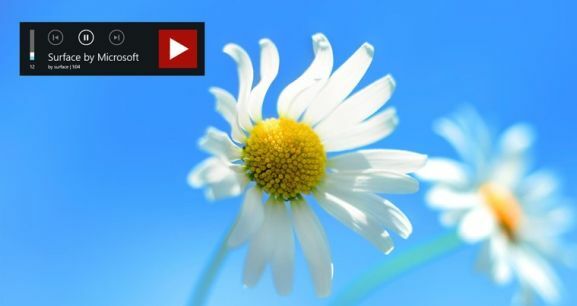 YouTube Player app for Windows 8 is a polished desktop client that comes with remarkable characteristics that makes it easy for Windows 8 users to watch videos on Windows 8 and enjoy them. 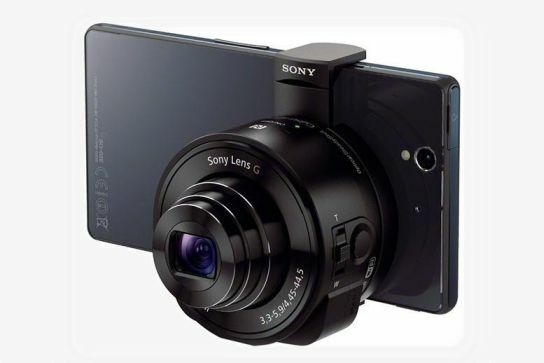 It gives pleasure to the users by giving them the freedom to alter the settings for better performance. It provides users with ample of alternatives like Most Recent, Most Popular, Most Shared, Most Viewed, Top rated, Trending videos and much more. You can see the videos in medium thumbnails from below these classifications that in turn are expanded on selection. Not only that, you can see title, author information, published date, rating, categories, comments and number of likes / dislike information. Similar to other places, clicking on Full Screen mode will open the video in full screen mode. In YouTube app the default settings like watch in 3D, resolution are provided in the full screen mode and the new videos scroll from left to right. The users are left with several alternatives to select, but the best thing is to display the videos according to classification. Clicking the category of your interest will transport all the videos under that category. Alternatively users can also search for various videos from search option. 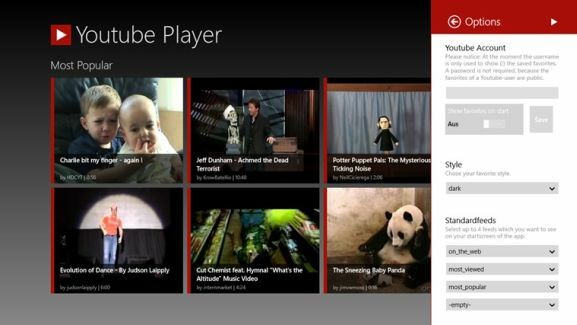 An equally good YouTube App for Windows 8 is ‘YouTube 8’ that has refined design and a user friendly interface. It eliminates the need to open the YouTube Webpage and searches and displays the videos directly on the desktop. YouTube8 is compatible with x86, x64, and ARM processors and is available in English. What impresses me more is YouTube Player can play your favorite songs in the background so you can handle much more useful task in the foreground. Moving the app in the background brings a minimized version of the player with volume control and options to play/pause the music. Avid YouTube users can login to their account and manage favorite videos from this app. The minimized player will let you quickly navigate between your favorite videos. The app comes with light and dark theme which you can select according to your mood. The Standardfeeds option will let you add up to 4 feeds, which ultimately be shown on the start screen of the app. 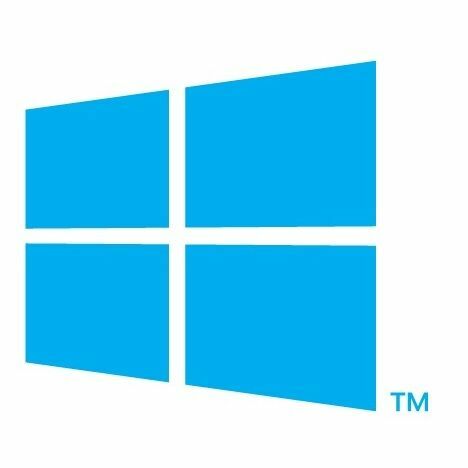 You can search and install this app from Windows Store. 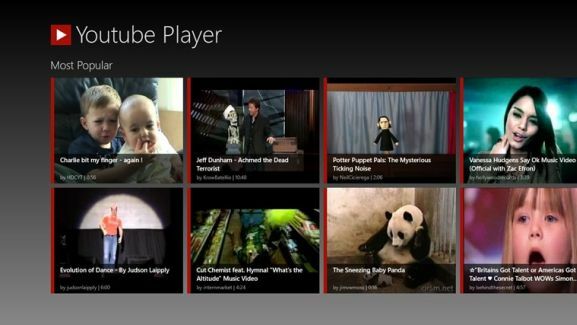 YouTube Player app for Windows 8 is a free style app for Windows 8 to search and watch YouTube videos within the app. 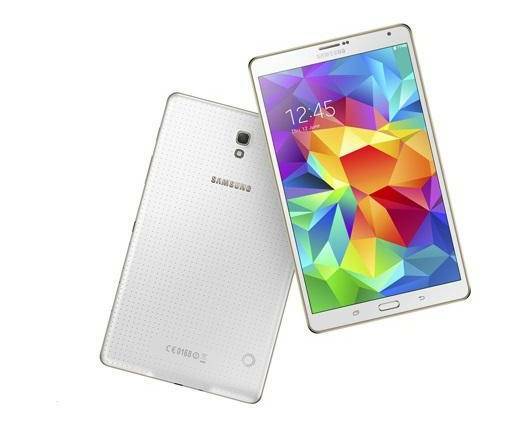 The app offers a plethora of options to play with, but due to certain restraints it can not give you the full control. The user interface is very simple and Modern-ish. The most enticing feature of the app is that it plays the video in the background without hampering the user experience. YouTube Player app comes with a safe search option only. It provides results that you want to see and you can avoid watching videos that contain potentially objectionable content. Undoubtedly, YouTube Player app for Windows 8 is the best desktop application for Windows 8 users. An alternate app called YouTube 8 is also a potentially good application that you might want to have a look at.